Ben Goldacre has written an incredibly important book that I have no doubt will go down in history as a classic case of how digitally connected communities are counterbalancing the power of the big healthcare brands and advertisers (a phenomenon that was outlined so well in Communities Dominate Brands – one of my all time favorite reads). Please consider buying the book, signing the AllTrials pledge, watching his TedTalk and at the very least follow this great communicator on Twitter. I just had a long trip home in which I really enjoyed listening to this 80 minute podcast discussion with Ben and James McCormack, Pharmacist, Professor, Medication Mythbuster, and Healthy Skeptic at the Faculty of Pharmaceutical Sciences at UBC. I’ve also played this very same drunken game (perhaps it was a thing everyone was doing at UCL Medical School back in the 90’s?) and while there is no doubt that we will be looking back at the problem of missing trial data in twenty years I think we will be looking back in even less time (perhaps just ten years) with an even greater amazement at the way we were largely ignoring the potential of Mobile (the newest mass media) and were categorically failing to properly document Doctor-Patient consultations. I think they will say ‘you spent billions of dollars creating Electronic Medical Records but you did it with a mindset that these records didn’t belong to the patients and in some cases you didn’t even give them access because you thought that was too difficult or something that you wanted to be paid extra to do?‘. UPDATE 25/11/13: I think they will say it was obvious that Patients with symptoms were having to wait years before finally getting a diagnosis because ‘if it’s not documented, it’s as if it never happened‘. UPDATE 3/12/13: I think they will say top Universities could get column inches for research that looked at the contrast between the openness with which hospitals shared car parking charges and the lengths they went to avoid pricing transparency yet no one was prepared to talk about the insignificance of price transparency when we have no accurate or fair way of comparing the quality of care being provided. UPDATE 4/12/13: I think they will say we debated whether the term “Patient” and “Doctor” were redundant and/or interchangeable with “Customer” and “Provider” but we didn’t realise that those feelings of “subordination” and “lack of empowerment” were originating from the fact that the Doctor was the only Professional we interacted with who didn’t provide sufficient documentation of interactions. UPDATE 18/12/13: I think they will say that instead of looking to the opportunity to avoid the need for 40% of in-office consultations in the first place we poured resources into over analysing the time lapse between when a Patient checked into a Doctor’s office and the time they entered the exam room as though a small average delay meant we were providing better care (that’s often not the case because in most cases the best Doctor is one who can spend more time with you if/when required even if it adds a little delay to the next Patient). UPDATE 20/12/13: I think they will say that you talked about the scope of “Big Data” but all your data originated from consultations that were poorly documented and where the vast majority of Patient narrative and symptom information was being lost because it was expected to be able to pass through the filter of the most overworked individual in the entire system (the consulting Healthcare Professional). UPDATE 15/01/14: I think they will say that you all realised there was this extraordinary phenomenon where we knew Patients were with holding invaluable information because they were concerned about “saving face in the doctor’s office“ but – despite the fact that more than 5.2 Billion of us were permanently carrying mobile devices that could be used to make a call and send a text message – you still remained fixated with the idea that all communication had to take place in-person within the confines of the office visit. UPDATE 21/01/14: I think they will say you had Doctors claiming that they were “no longer in a position to control their own image” as documents with their name on them found their ways into Patient’s hands even though they didn’t even originate from their office but although they realised their image was only getting “increasingly undifferentiated, bland, and unremarkable” they did nothing to document their 10 minute consultations with Patients even though they were aware that outside these Patients were spending “hours interacting with… …pharmaceutical industry and malpractice attorney television commercials, arguing with their health insurance companies, waiting in line at the pharmacy, surfing medical websites of varying credibility, listening to the advice of celebrity physicians, formulating an opinion on the Affordable Care Act based on the musings of cable television pundits… …offering the illusion of legitimacy“. UPDATE 22/01/14: I think they will say that you had research showing that 1 in 6 women who sought abortions were victims of physical or emotional abuse at the hands of partners and the London-based Abortion Support Network was only discovering through their “financial assessment” process that they were trying to support the needs of women who were in or escaping abusive relationships but you still remained fixated with the concept of having such sensitive communication taking place in-person within the confines of the office visit. UPDATE 23/01/14: I think they will say that you appreciated that there was normalcy bias – a maddeningly typical tendency amongst women that led to them trying to minimize or dismiss symptoms, apologizing for making a fuss or troubling healthcare professionals, ignoring symptoms in the forlorn hope that they’d go away, etc – but we did nothing to help make taking the first steps to getting care any easier. UPDATE 26/01/14: I think they will say that you would require Doctors fulfil their CPD (professional development) requirements by sitting for upwards of 20 hours a year in meetings as though that was some valid measure of them being up to date with their research and clinical skills when you could’ve just required them to conduct 20 documented consultations (that could be reviewed/scored/compared/analysed until eternity) with Patients who have complex health needs? UPDATE 4/02/14: I think they will say that the records of the NHS watchdog revealed that less than 3% of complaints which came to them were being “fully investigated” but in all the finger pointing and passing of blame no one considered that the resources of the NHS would be better spent providing documented care in the first place rather than having to continually waste resources investigating poorly documented interactions. Obviously this different process would also enable Hospitals to learn from their mistakes and build systems to prevent them happening again while also enabling Patient access to documentation to be a basic requisite of the care contract (which would automatically drive accountability, prevent cover-ups and avoid the costs associated with ineffective watchdogs). UPDATE 5/02/14: I think they will say we drew up “Open Disclosure Frameworks” to enable health service organisations and clinicians to communicate openly with patients when health care does not go to plan but while we talked about this being “a patient and consumer right” we didn’t once think that we should be designing interactions so that patients who aren’t encountering ‘adverse events’ are also treated respectfully. UPDATE 18/06/14: I think they will say GPs campaigned to draw attention to the fact that nearly half of all adults in England find health advice given to them by doctors and health professionals too complicated, that Patients can often feel too embarrassed to ask their doctor questions when they don’t understand something and that Patients can fail to receive the right care at the right time because healthcare environments haven’t recognised their needs but we didn’t once think that we should be designing interactions so that the literacy of our Patients is automatically assessed before we meet and so that we can ensure Patients are being given a written copy of the information that was shared in consultations. UPDATE 30/06/14: I think they will say Politicians hyped half baked ideas about retrospectively using data to name and shame Doctors with ‘red flags’ on the NHS website whenever it appears that they’ve missed symptom information despite the evidence that Patients aren’t even avoiding hospitals that are involved in high profile scandals involving the deaths of Patients and the same data (and even more if we’re prepared to let Patients help) could be used in real time to help clinicians in decision making process. UPDATE 08/07/14: I think they will say Reproduction Health Foundations launched ‘The One Key Question® Initiative (OKQ)’ in an attempt to encourage Primary Care Doctors to ask women “Would you like to become pregnant in the next year?” despite the clear evidence that showed Patients would be more honest answering questions presented to them by a computer, the widely recognised annoyance of being interrupted by time pressured Doctors before you get the chance to explain your symptoms (imagine being cut short while explaining your migraine symptoms by a Doctor who wanted to know about your reproductive plans?) and the opportunity there is to have this question feature within more comprehensive Patient History taking tools that you could use in your own time eg. in the waiting room or as part of an annual online check up? UPDATE 27/10/16: I think they will say how did you justify prescribing expensive drugs to Patients whose sleep we didn’t monitor? What do you think is the current aspect of medical practice that people will look back on with the most shock and amazement? 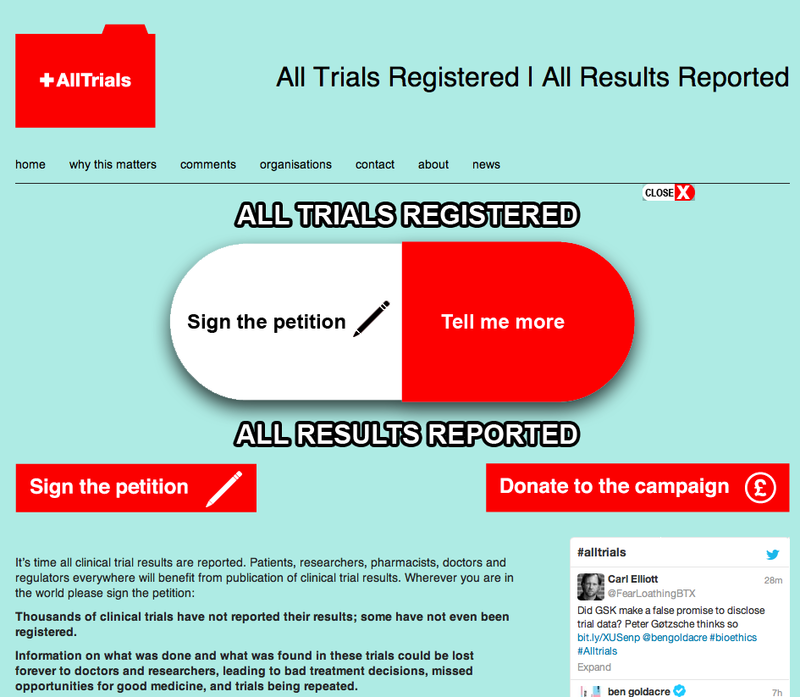 7 Responses to AllTrials.com or AllConsultations.com?